Give your home a brighter look with colors reflecting the upcoming spring season. 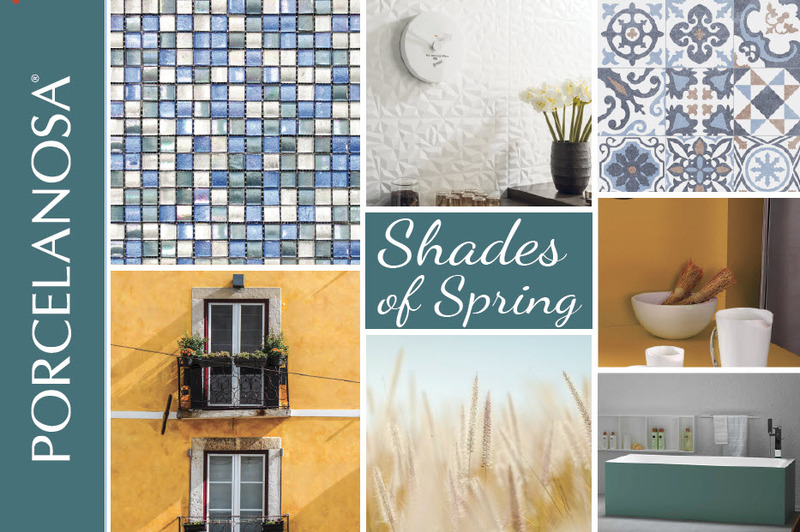 Fresh and exciting color palettes, bright combinations, and floral inspired hydraulic patterns are just a few of the designs inspired by our spring mood board. Our ARABIA MIX BLUE SILVER mosaic is a mesh mosaic composed of an array of different shades of blue, cream and silver. The combinations combine into a striking display of color and shine. The PRISMA tile, available in Spring of 2016, is a geometric white display, featuring triangles arranged in a hap hazard pattern. Geometric designs come to life in the modern Barcelona collection, where BARCELONA F is among many choices for wall tile. Lovers of designs from the start of the 20th century will be drawn to the vintage hydraulic patterns. KRION GROUND 6503, one of many in a wide range of colors, is a solid surface material that is warm to the touch and feels similar to natural stone. KRION® is a hard-wearing, highly resistant and easy to repair material that only requires minimum maintenance. Porcelanosa offers KRION® in a wide range of colors, including a white finish that stands out for its purity and neutrality in comparison with other similar material. KRION® is an ecological material, as it is 100% recyclable and can be reprocessed and reused in the production cycle. The MODUL bathtub, part of the Krion Modul bathroom collection, is made of an easily repairable, easy-to-clean material with an absence of porosity, high resistance, durability, low maintenance, and warm-to-the-touch appeal. Available in multiple colors, we picked the MINT finish to represent a bright shade of spring.